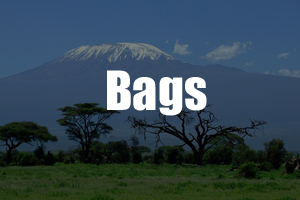 Kilimanjaro Clothing – Requirements and Recommendations for Kili! On Kilimanjaro you will be trekking through 4 climatic zones. Weather can range from warm and tropical at the base of the mountain to freezing on the summit. To ensure that you remain perfectly comfortable in each zone it is critical that you understand the concept of layering with your Kilimanjaro Clothing. Being able to layer up and layer down as the weather changes is important. Layering only works if each layer supports the wicking process (allowing moisture to pass from one layer to the next). Layers should therefore hug the skin (i.e. not be too tight, but equally not too loose) and consist of wickable fabric. Cotton should be avoided as it is hydrophilic, meaning that moisture struggles to pass through and therefore the wicking process stops. 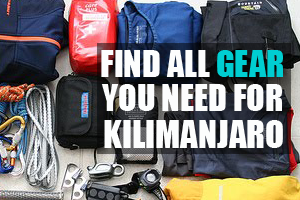 Here are the layers of Kilimanjaro clothing that you need to take with you. Depending on the length of your trek you should bring 4-5 pairs of sports underwear. Those made by Icebreaker are excellent. Alternatively any sporting brand underwear will work (e.g. Adidas). For the ladies bring two pairs of sports bras, again we recommend Icebreaker sports bras. As you approach the upper reaches of the mountain you will need to wear a lightweight base layer (or next-to-skin layer) over your underwear. You will not need to wear this layer for the first few days on the mountain (unless it is very cold). On summit night this is arguably the most important layer as it is the one that comes in contact with your skin. We recommend Smartwool Lightweight Base Layers or Icebreaker Base Layers, both make products from 100% merino wool. Their products are super comfortable, great quality and provide incredible moisture control. If you are allergic to wool then Patagonia Capilene Lightweight Base Layers are great synthetic alternatives. For treks less than 8 days, one pair of top and bottom base layers should be sufficient. For treks over 8 days you should get at least 2 pairs to avoid smelling terrible by the end of the hike. You won’t use this layer everyday, but will need it during the cold nights and on summit night. In terms of trekking shirts we recommend 4 x short sleeve shirts and 2 x long sleeve shirts. Ideal fabric is a breathable, lightweight and quick-drying polyester, merino or nylon. Make sure that your shirts are not cotton. Our partner, Mountain IQ, have an awesome selection of branded Kilimanjaro hiking apparel. 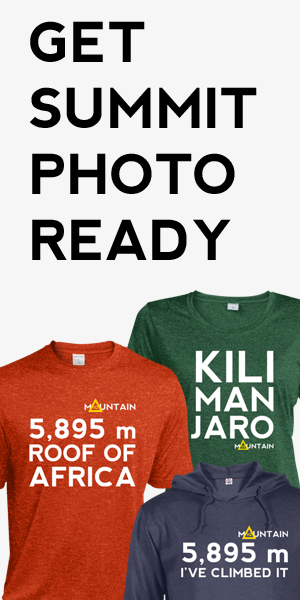 Get 10% off Mountain IQ gear with our discount code ‘KiliTrek‘. 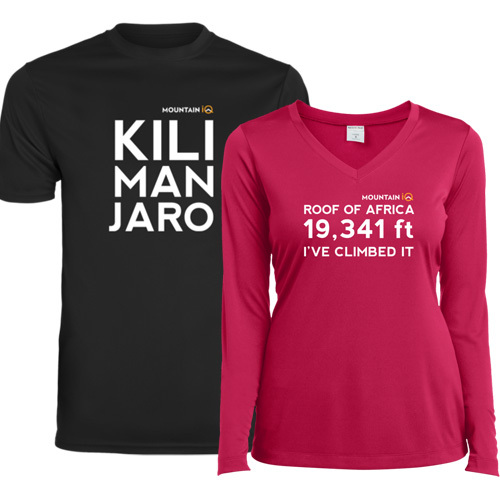 See their full Kilimanjaro collection. Other great trekking shirts are made by Icebreaker, Craghoppers, Columbia and Patagonia (see their Capilene range). You will also need to bring 1-2 x pairs of hiking trousers – 1 is fine for a 7 day trek, an additional pair is ideal for treks greater than 7 days. If you like wearing shorts then 1 pair of trekking shorts is worth bringing as well. These trekking trousers and shorts from Fjallraven or Craghoppers are good. We also quite like these convertible trousers made by Craghoppers. For the colder stretches on the hike and for summit night you should bring one mid-weight fleece jacket or parka top. This is your second layer, or insulation layer, and should be used in your layering system over your base layer, or indeed as a standalone that you wear over your trekking shirt when temperatures start to drop. They also come in great use at night when it can get very cold out. Fleeces that use Polartec materials are great. Typically Polartec fleeces come in 100s, 200s or 300s. The 100s are a little light and 300’s too heavy. Two-hundreds provide great warmth and comfort, and are perfect for hiking Kilimanjaro. Here are some good Polartec-200 Fleece Jackets. Noteworthy brands include North Face, Helly Hansen and Patagonia. A nice feature to look out for in your fleece jacket is a hoody. This can double as an instant balaclava. See the Patagonia R1 Hoody or the Arc’teryx Fortrez Hoody for good examples. The core shell layer or third layer consists of a windproof, waterproof and warm jacket and trousers. Warm jackets are a minefield of complexity but typically split into two main types – down or synthetic (and some are insulated with wool). Down jackets are lighter and generally warmer than synthetic alternatives, but are more expensive and generally don’t perform well in wet or moist conditions. Weight and warmth: The weight of a winter jacket can vary from super light (less than 450 grams) to super heavy (more than 1kg). The lightest winter jackets use a down fill and can weigh as little as 200 grams. Down provides the greatest weight-to-warmth ratio. Generally, the lightest jackets (down or synthetic) provide the least warmth and are therefore ideal for moderately cold environments, but not freezing alpine or high altitude environments. Heavy jackets (down and synthetic) are generally the warmest type of jacket but can be cumbersome to transport and trek in. We suggest a mid-weight winter jacket (~500-700 grams) for Kilimanjaro. Waterproofing: Despite the dominance of down jackets in terms of weight and warmth, they do have a major flaw – as they are much more susceptible to moisture. When down jackets get wet they lose their loft and insulation capacities. This is not to say that a light downpour or even all day snow is going to destroy the insulating qualities of your down jacket, but in similar conditions or very wet conditions, a synthetic jacket will perform better. The key thing to look for, therefore, is a jacket (down or synthetic) that has an outer fabric that has a high water-resistant capacity. Pertex Shield fabric is the best for down jackets and nylon is great on synthetic jackets. Versatility: Unless you plan to use your jacket for a particular activity after Kilimanjaro (e.g. ice climbing, snowboarding) we suggest going for a jacket that provides as much versatility as possible (i.e. can be used for many different activities in as many different environments). In terms of a good and affordable down jacket we recommend the North Face Nuptse Jacket. It retails for a great price, is super-lightweight which makes it easy to travel with and really warm. Other brands that make great winter alpine jackets include: Arc’Teryx (see the Atom), Rab (see the Microlight) and Mountain Hardwear. For the upper reaches of your Kilimanjaro trek (>4,500 meters) the temperatures can get very cold, particularly at night. Warm trekking trousers are a must. Here are the key characteristics to look out for: Water resistant, sun protective, and fleece inner material with quick-drying polyester outer for warmth. Alternatively, some folk prefer to use a hard shell pair of trousers, similar to ski pants or salopettes. These trousers will have a waterproof membrane and insulated inner fabric – we recommend Columbia Bugaboo pants or at the higher end, the Arc’Teryx Gamma. In addition to these items we recommend taking with you a hard shell jacket and some lightweight rain gear. In terms of the hard shell jacket we recommend the North Face Resolve or similar. For a quick rain cover you might also want to bring a poncho that sits over your body and daypack. Ideal for the lower reaches. 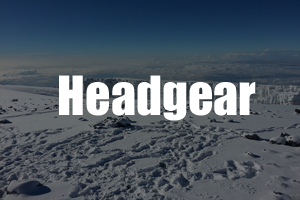 Here we cover useful gear to keep your head out of the sun during the hot and high solar radiation days that you will experience on Kilimanjaro, as well as keep your head warm and cosy on summit night. Gloves and walking / trekking pole requirements. Both are critical. The former is very important as your hands are the first to start freezing on summit night. The latter can reduce the impact on your knees by up to 20%, which is a major win when you are descending from the slopes of Kibo. From hiking boots to socks and gaiters. Your feet are what get you up Mount Kilimanjaro. Don’t fall victim to purchasing bad boots or socks that will give you blisters! From the Kilimanjaro kit bag to your day-pack. In this section we have provided useful recommendations on the all important duffle and daypack bag requirements. Kilimanjaro sleeping bag recommendations and other useful sleeping accessories, like an inflatable pillow. 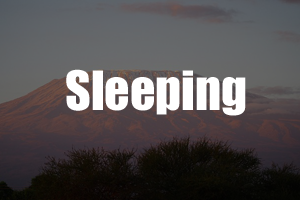 The sleeping bag you choose is important as the nights on Kilimanjaro can get below freezing. 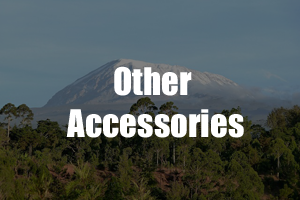 Kilimanjaro accessories including water bottles and medications. You can also find detailed information on Diamox (the high altitude sickness prophylatic medication) here. 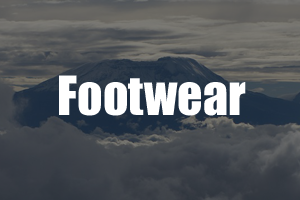 If you have any further questions on Kilimanjaro clothing, please leave a comment below and we will respond within 24hours. this is such a great list! do u have a similar one for women? Hi Sarah, thanks! Most of the gear listed here comes in men and women variants. The link might take you to a male variant but you can then just search for the equivalent women’s version. Hope that helps! Hi Jay, sorry for the slow response. Ski gear can work very well. The key is to ensure that you have your layers sorted and that you are warm and comfortable. Your jacket and gloves are particularly important so as long as you are happy that they will keep you warm at temperatures that drop well below zero then they should be fine. Hope this helps! Hi — Thanks for putting together this list I’ve found it really useful! It’s just the jacket I’m struggling with… would it be sufficient to wear a good quality down jacket with a lightweight waterproof over the top (obviously with warm under-layers too!) or would I be better off just getting a more durable ski/outdoors style jacket instead of the two? Advice much appreciated! Thanks a lot. Hi Andrea, Choosing a jacket for Kilimanjaro can be a little tricky. Down jackets obviously have the advantage in terms of warmth to weight ratio, but they are generally more expensive than synthetics and it can be damp at the top of Kili which does effect the performance of down. A lightweight waterproof over the top of a down jacket can help prevent damp issues with the down. For me it really depends how often you plan to use the jacket in the future and in what environments. If you spend lots of time in cold but dry environments (i.e. the Alps), then a Down is probably a good investment, but if you plan to spend more time in cold and wet environments (i.e. UK outdoors) then a synthetic will serve you better. A good quality synthetic ski / winter jacket is more than sufficient for Kili. Hope this helps. Thank you for the guide, I’m climbing Kili in March with a group of women. I have a question about layering. My husband insists that my base layer should be polyester but you suggested wool. It appears I’ve bought plenty of base and long underwear. That problem is that I’m pretty obese, climbing this mountain will be a huge challenge for me, and many of my layers are pretty snug because not many companies make hiking clothes in my size. Would you recommend wearing my wool shirt under my polyester shirts? And (in all seriousness) could I skip my insulation layer because I’m fat and I already have a built-in one? 🙂 I’ve got a down jacket but again, it’s snug, and I’m not sure I could fit a fleece jacket underneath it. I plan to rent another larger jacket for summit night. Hi Christa, thanks for getting in touch and good luck with your Kilimanjaro climb! In terms of base layers, merino wool or equivalents are great as they provide good breathability. That being said, most synthetic alternatives today are pretty good, so as longs as you are comfortable then I don’t have too much of a preference for either. Smartwool, Icebreaker and Patagonia make good base layers. The key with Kili is to give yourself options, this means layering so if you are too hot or tool cold you can easily take layers on and off if needs be. Down jackets are great as they are light weight and have brilliant warmth to weight ratios. I would as a minimum have your base layer, a fleece and winter jacket. If it is snowing you may want a shell jacket as well to protect the loft of the down. Hope this helps! 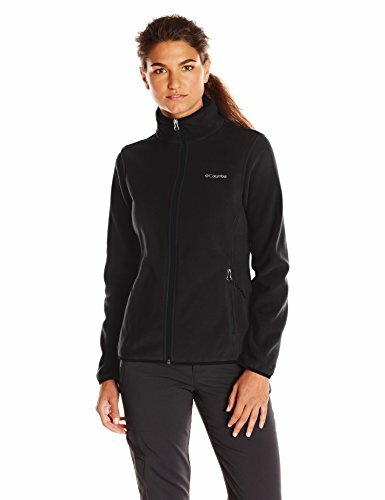 For the second, insulation layer I am trying to decide between the Helly Hansen Women’s Regulate Midlayer Jacket and the Helly Hansen Women’s Zera Fleece Jacket – would the Midlayer Jacket be too heavy, or a better choice because it looks wind resistant as well? Hi Caitlin, for the insulation layer I would go with a fleece material jacket, so the latter sounds more appropriate. That being said, if you go for a heavier insulation layer, then you can go for a lighter out-core layer (something that is more wind and water resistant, and less orientated towards warmth). Hope this helps! I have just read through the entire kit list. I have yet to see a better, more comprehensive list. Congratulations. I’m having a hard time finding insulated and waterproof warm pants that aren’t snow pants. And all the snow pants I’ve tried don’t seem like they would be easy to hike in. Besides the base layer, I’ve heard that some people layer fleece pants with waterproof rain pants. Would that still work for warmth on summit night? Hi Courtney, fleeced trekking trousers would do the job, as long as you have a thermal base layer underneath. I can often trek comfortably down to -10 degree C with just a thermal base layer on my legs and a lightweight waterproof goretex pair of trousers (not insulated), but some people feel the cold more so I would recommend taking a fleeced pair of mid-weight trekking trousers. Hope this helps! Hiking pants which appear to be similar to powder pants , ext nylon with insulation with sippers down the side . Will this suffice or am I better off with fleece pants under regular hiking pants ? Hi Rich, Your Moosejaws will be absolutely fine. When used in conjunction with thermals for the summit night they should be more than warm enough. Cheers! Ill be climbing Kilimanjaro in December and I am wavering between using my winter leggings (wear under my ski pants when I ski) and fleece pants which I have read are good for hanging around camp and also the summit day. Any thoughts on which will suffice (I tend to get cold easily) and if fleece pants, which ones you recommend? Thanks! Hi Lauren, winter legging or a good merino base layer should provide enough warmth when coupled with warm (lined / or fleeced) trekking trousers. Most of the major brands make lined hiking trousers, I like The North Face trousers, but even cheap brands like Columbia have good fleeced / lined hiking trousers. Cheers! 1. I have two options for warm trekking trousers: Mountain Hardwear Yumalino or Black Diamond Stance Belay. Which one of these is the better choice for the hike? 2. Jackets: I have two fleeces (Patagonia R3, North Face Tenacious), as well as a Marmot Quasar and Minimalist. Will they provide sufficient wind protection for my torso? Hi Ed, thanks for getting in touch. In terms of question 1, I have had a quick look at both options online and they both seem more than sufficient. I would recommend going for the warmer of the two though. Question 2, you core layer looks great, I would build your layers as follows: fleece (R3), followed by your Quasar jacket, with your hard shell Minimalist over that. If you get too hot you can always delayer. Best of luck! Where can I purchase the raingear as shown in the picture that covers the body and daybag. I like this. Hi Pat, you should be able to purchase a poncho like the one in the image from Amazon or at a good outdoor retailer, like REI. All the best! 1. I have my own down jacket already, but I’m going to Tanzania for a month so don’t really want to carry it around the whole time. I’m going with a reputable company, is it generally ok to hire one from the company or would I be better off bringing my own? 2. The route is 10 days. Do people generally swap their t-shirt every 2 days… meaning I would need to bring 5 tshirts? I don’t want to bring too much stuff but nor do I want to stink! It’s the same question for underwear really, I feel like I would want to bring a clean pair for every day but you’ve only suggested bringing 4-5. 3. I have a fleece but it’s quite heavy and doesn’t pack down small. I also have a very packable ultra-light down jacket that I have worn before in sub-zero temps as a mid-layer under my proper down jacket. Would this do, or would you still recommend taking the fleece? 4. With regards to warm trekking trousers, would it be enough to just put fleecy leggings on under my zip-off trousers, or even do that and also put the waterproof trousers over the top, or do I need specific dedicated warm trousers? I have ski trousers, but like the poster above I’m not sure how good they’d be to hike in. 1. I would confirm with the trekking company that they will be able to either rent you an adequate jacket or take you to a rental store to hire one. 2. 10 days seems like a really long version of the Lemosho, are you sure it’s not the Northern Circuit, or an 8-day Lemosho with a pre and post in Moshi? In terms of clothing, 4-5 shirts should be fine, with a single base layer. You can wear a shirt of 2 for a few days. 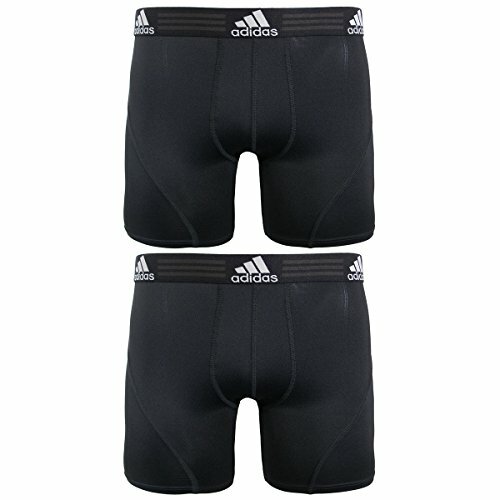 I recommend bring merino wool underwear, these breathe very well and can easily be used for 2 days straight. 3. What you have sounds fine, although a light fleece is always good to have. 4. A combination of your leggings with standard trekking trousers and your hard shell waterproof trousers should do you fine. Hope this help!! Best of luck with your Kilimanjaro adventure! In which category (100,200 or 300) would the R2 fleece zip Patagonia be ? I just want to make sure it will be enough… Or maybe should I just go for just one fleece? I could also add a sleeveless down jacket, to keep it warmer, then winter jacket on the top of all of that for summit night. Hi Caro, The R2 is quite a heavy fleece, leaning towards the 300 range. I would say you only need one fleece, ideally a 200 in weight (like a mid-weight fleece). You can combine this with a sleeveless jacket for cold days / nights, and your winter jacket for the summit night. Hope this helps! Hi and thanks for this answer! – and for summit night, I would add on the top of that my nuptse 700 down jacket and the GTX rain jacket ?! On the buzzer, Cara. That will give you enough layer combinations to cater for all weather eventualities. All the best! I am looking into sorting out my Summit night bottom gears… would a wool 260 base layer + Craghoppers Kiwi Winter Trousers + goretex rain pants (in case against rain or wind…) work ?! All three pairs would work, but I would go for the North Face Sally pants as they are great quality and not too expensive. Hi Chris, that should be more than sufficient for your summit night! My husband and I are both planning to use our ski jackets and bottoms for summit night. Mine is an all-in-one combination, will this be okay or should we consider lighter alternatives. Hi there and tks in advance for the answer! 2) In addition, do the sky glasses work well in the mountain? Tks again and congrats for this helpfull guide! Hi Victor, The layer combination you have set out will work well! Remember to have warm gloves, socks and a beanie as your hands, feet and head will be the first to start feeling the cold. Not sure what you mean by sky glasses. Any pair of high UV glasses will work. Goggle are overkill. All the best! Hi! Tks again for the answer! Sorry for the spelling! I meant Ski Goggle….but I got it, the UV glasses should be enough. 1) Is it necessary a balaclava for the summit day?? I feel really unconfortable wearing it since it covers my mouth and nose. 2) I have an excelent 40L bag for trekking, but I’m not sure if it is too big for this journey. Actually, I think it depends much more on the stuff you put inside the bag than the bag itself, but I want to be sure if the size of the bag won’t be a problem. Once again, tks for your help!! A balaclava is not necessary, but I recommend bring a Buff headwear scarf, ideally one with a part fleece section: See examples here . 40L daypack is slightly on the big size but you are right it is more about what you put into your pack. You should be absolutely fine with a 40L that’s half full! Hello! Thanks for putting together such a comprehensive gear list. I am thinking of taking a Canada Goose Expedition or Trillium parka for the summit night. Do you think that would be too heavy? HI Vai, personally I think those two options are too heavy. The warmth to weight ratio seems too high in my option. You need to to into account the 15kg weight limit for all your gear and I suspect with a Canada Goose or Trillium jacket you would be sacrificing a lot of weight. In my opinion a light weight but warm synthetic alternative or if you can afford it, down jacket, is best. All the best! Pair of light-weight trousers for the first 2 days then switched to a pair of Berghaus goretex windproof trousers (including summit night). Base layer – North face reaxions (short sleeve) to start and then Helly Hansen long sleeved (inc summit night). Merino wool tights for summit night only. Rainy (only a bit of drizzle) – Berghaus Mera Peak. Socks – Bridgedale from lightweight to summit as required. I’m heading back next year with my daughter so any suggestions for ladies sleeping bags would be appreciated. Hey I was wondering what size you would recommend for the daypack? 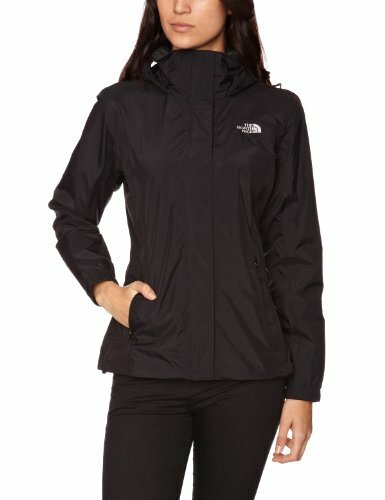 Also would a North Face Triclimate Parka (with adequate layering underneath) be enough to double as a rain jacket and for getting closer to the summit or would you recommend something even heavier? Hi Ali, for your daypack a 30L is more than sufficient. As for The North Face Triclimate, it should be sufficient for summit night when used in conjunction with yiour other layers. Not sure how well it performs in wet weather so you might want to have a light and cheap poncho or rainsuit to throw over yourself if it rains hard! with layering will this be sufficient. also Im considering taking ski pants as a warm layer for legs …is this excessive? Hi Jo, I’m not too familiar with the Glissade. It looks like it is a waterproof jacket first and foremost, but does have a fleeced inner layer, I assume you have that layer in your jacket. I suspect it doesn’t provide the greatest insulation and therefore might not be the warmest choice for Kili, but if you layer up well you should be okay. As for your legs, fleeced trekking trousers with a thermal base layer is sufficient for Kilimanjaro. All the best. Hiya. Great list of items but I’m now starting to wonder if I’ve just bought the wrong equipment. The trousers I’ve bought are a windproof softshell. Not water proof but supposedly warm for the colder parts of the climb. Is water proof essential or at the very least more important or am I ok? Hi Harinder, no need to panic, windproof softshell trousers for Kili are fine. I would however bring some lightweight waterproof throw over trousers or a poncho should you get rain lower down the mountain or snow near the summit. Cheers! I have a pair of insulated Returnia (mountain hardwear) pants for summit night. But i am now wondering… Would this be enough on the top of a base layer in 260 merino wool, or should i do wool base layer + craghoppers kiwi winter pants + insulated pants (writting it sound a bit much but maybe it would be better…) ? Hi Kath, your insulated trousers over the top of your base layer should be more than enough. Cheers! first of all, as a solo woman how easy do you think is to do it? and second, i might have get lost a bit but, what happens with the tent? is it usually provided by the tour guides? wouldn´t be recommended to bring one as well? Love this page and finding the information exceptionally helpful. I am having a slight problem however with finding a suitable sports bra to wear. I am what you would call very well blessed and none of the makers of the merino bras go anywhere near my size. I have found a few products that claim to be be moisture wicking but are made of nylon or polyester. Which would be better in this situation? Hi Vicky, both high wicking nylon or polyester are good options. Just make sure that they are comfortable to wear as that is the main aim. Hi, would the Marmot Montreal be too big/bulky/heavy? I’m 5’11 and it’s difficult to find a jacket that is long enough, but this one does the trick. I’m just worried about packing and lugging it up the mountain. Hi Cait, The Marmot Montreal would do the job, but it isn’t specifically designed for sport use and cumbersome. It is better suited as a winter jacket to be worn out and about in town. That’s not to say that it won’t work on Kili, but I would rather go for a jacket that is designed for winter activity sports – like winter hiking, skiing etc. Hope this helps! I dont see any tents or beds in any of the lists. Does this mean that they are always provided by the guides? Or that this list is only suiteble for the route whit the cabins? Hi Maarten, all camping equipment (tents, cooking gear etc.) are supplied by your tour company and carried by porters. All the best! hello, this is very helpful. i bought a patagonia re-tool pullover fleece as my first mid layer. for my second mid layer i was debating between the patagonia down sweater hoodie or the haglofs essens III down hoodie. both have 800 down fill but the haglofs has a pertex shield fabric vs. the patagonia one which has a “water-resistant shell is made of 100% recycled ripstop polyester with a durable water repellent finish.” i am leaning towards the patagonia one but wanted your thoughts. i was going to cover all this with a hard shell rain coat. i’m just worried since i tend to get very cold. thank you so much! Hi Sam, both options are very good. I like Patagonia too so if you like the fit and brand then go for that one. The combination of your base layers with your fleece, down jacket and hard shell should be more than enough to stay warm. Remember the first things to feel the cold are your hands, feet and head so make sure to have good gloves, warm socks and a warm beanie and buff (head/neck scarf). Cheers! This whole series of articles is very helpful! Thank you! My husband and I will be attempting Kilimanjaro in late June next year. We will be doing the Mount Kilimanjaro marathon two days before, so we are hoping to invest in additional light gear that will pack well and keep us from hauling too many bags to store during the hike. We really like the specs of the Mountain Hardware Ghost Whisperer jacket- light, down, very packagble, etc. but it seems too good to be true! Is this a jacket you are familiar with, and if so, is it truly warm enough for what we will need for this climb (Smartwool and Mizzuno breath thermo layers underneath). We do have rain shells to go over the jacket, just in case. Oh, we are doing the Northern Circuit, so a day time summit though hopefully followed by a night in the crater, if our bodies have cooperated with the altitude. Hi Christy, Thanks for getting in touch. The MH Ghost Whisperer would work really well on Kili in combination with your base layers and hard shell. All the best with your trek and marathon! Hi, I plan to borrow an army issue Sleeka jacket ( original) as a down equivalent, and wearing an outer rain jacket, us this sufficient for summit night? Also, I intend to borrow army issue sleeping bag, is this sufficient for Kilimanjaro at night? Hi Sukhbir, yes, both should be sufficient. 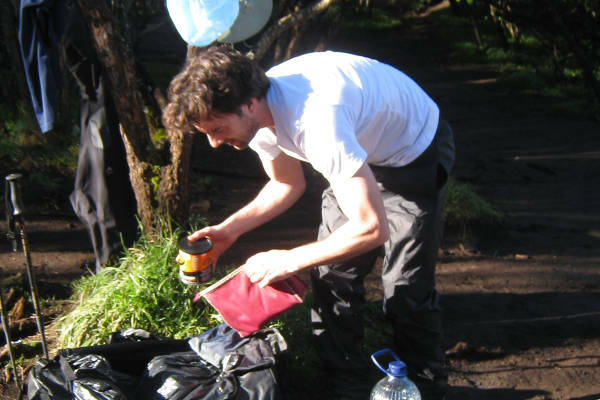 Just make sure the sleeping bag is 4-season, as it can get pretty cold at night on Kilimanjaro! Hey Erik, wow, very organised! From what I can see you are all set! Best of luck with the trek! I am climbing Kili in early August on a 7 day Machame route this year and am tying myself in knots trying to get my layering right! I see I am in good company here and this is the best site I have found for advice so thank you so much for creating it! So, I will get some merino base layers of various thicknesses for all stages of the mountain but my main concern is as the temperatures drop what I will need in place. (I feel the cold!). currently on top of said base layers I will have a Rab polartec power stretch pro jacket which is warm but feels like it maybe on the thin side for sub 0 temps? and a rab alpine microlight down jacket (650FP), and then a waterproof hardshell on top (thinking maybe from the Berghaus new extreme range?) This keeps me about warm at 0 temperatures if I am active, but my concern is summit night and around camp in the evenings. Perhaps I should get a polartec 200 fleece as a second midlayer? And should I then rent a thicker down jacket for summit night? I don’t really want to buy one at those costs if I am only going to need for it 6 hours of the trip on summit night. I was also thinking of wearing thermal leggings like Rab power stretch pro over base layer leggings plus waterproof trousers for summit night, would this be ok? I am much more comfortable walking in leggings than trekking trousers so was going to bring various thicknesses for all parts of the mountain – plus waterproof trousers. Would this work? Hi Hayley, In terms of your torso and legs, your suggested gear should be absolutely fine. A second midlayer is not a bad idea if you are very concerned about the cold. I would recommend you get very good quality thermal gloves and make sure your feet and head are kept warm too, these are the first areas to feel the cold. Beyond that you sound all set. Goof luck! Thank you for this comprehensive list! The comments and replies are so helpful too! My husband and I will be climbing Kilimanjaro in October and I am starting to think about our equipment. I was thinking about buying the Patagonia Vosque 3-in-1 parka for the climb. I like the idea of being able to use it in our cold Chicago winters after the trip. But do you think it will be too heavy or not technical enough? Thanks for any advice! Hi Stephanie, Glad you like the site and it’s proved helpful. I have not seen the Patagonia Vosque before but having looked online it appears that the jacket is more adequately designed for cold Chicago winters as opposed to high altitude mountains. That being said, I think it would actually work on Kili. In principle, if it keeps you nice and warm, and is waterproof then you should be good to go. I would however pop into the shop and discuss it first with a Patagonia employee before you buy it. Hope this helps! It seems a bit heavier than your guide recommends. I can either ditch this and get something different, or tweak my inner layers a bit. What do you think? Hi Eliot, this will work well with solid base layers and an additional mid-layer fleece. You may still want a warm synthetic down jacket though for additional warmth. Thank for the comprehensive list and all the helpful tips. I am climbing Kili in July and was wondering if a down jacket (650 fill) would be enough on the summit night along with a med layer of fleece. Hi Nihar, you should be good to go with this combination! Cheers! Hi Mark, I am finally on my final leg of preparation to embark on my teenage years dream of taming these gorgeous mountain. My last question is clothing. You suggest merino wool clothing. I live an active like style and have a lot of under armor products. Since one of their business target is back country hiking and all I was wondering if you recommend their ColdGear outfit as a substitute for the merino wool material you recommend? Hi Daniel, great to hear that you are nearly all set for your adventure. Under Armor ColdGear will do the job just fine. All the best! Great! Thanks very much. Will be in touch after my conquest! Be safe. Hi, thanks for such an awesome and organised guide! I am going to be climbing kilimanjaro in July and also going snowboarding in October. This jacket is laboratory tested to – 40 degrees C so should be easily warm enough with layers and has armpit zips for if I get too warm which I really like (I burn a little hotter than most). However the waterproof rating is 10000mm and breathability is 5000g. Will this be sufficient for Kili, or will water begin to seep through it in heavy downpours? I am particularly worried it might sleep through where my pack applies pressure on my shoulders/waist! Hi Mark, you should be absolutely fine with this jacket. Rain is very unlikely near the summit, snow is possible but generally it is light and not wet. It may be worth having your rain outer shell with you on summit night if the weather is looking dodge. All the best! Wow thanks, that is a relief! Just to confirm though, by rain outer shell do you mean a poncho (like the one pictured in the rain gear section of the guide) or just another waterproof jacket that goes over the top of this ski jacket? Hi Mark, a poncho would work, but if you are taking a rain jacket or hard shell jacket, then this would be the preferred option. Good luck, I’m sure you’ll have a blast! Great list! I’ve lived most of my life in FL, so purchasing cold weather gear is absolutely new to me. We are hiking Mandara to Summit in July. I’m looking at Outdoor Research for some 3rd layer jackets, would you have a recommendation between the Floodlight Down (its 800+ fill power down is utterly undaunted by wet weather) or the Diode Hooded Jacket (perfect for preserving warmth in cold, damp environments where pure down could wet out, the ingenious Hybrid-Mapped insulation and fabric of the Diode provides functional, water-resistant warmth in variable conditions.) I’m having such a hard time determining which makes more sense! Hi April, both jackets could work. Given a choice between the two I would go for the Diode, but it is obviously more expensive so it is really up to your budget. Either way both would work on Kilimanjaro. All the best! Climbing Kili with family beginning of January 2018. Question about bottom layers for summit (daytime summit, leaving 5am). I own a pair of insulated ski pants but they are really not comfortable enough for hiking, not enough give so to speak. Would a pair of smartwool long underwear (maybe even two), a pair of fleece pants and a pair of Columbia Storm Surge waterproof rain pants work? Thank you, and this is a great website! Hi Kristin, you will be absolutely fine with a good base layer and fleeced pants. But as you mention an additional hard shell waterproof layer like the Columbia Storm Surge is a great option! Good luck! Legs – I understand the benefit of the convertible trouser, but do I need this in addition to trekking trousers, and waterproof trousers? Do you wear all of them at the same time? (i know I’m asking stupid questions, but I’m really confused over the need for several types). I’m planning on using OEX Women’s Barneo base leggings over my under wear, and then was thinking just a pair of trekking trousers. But it seems i need more. Third layer: North Face Resolve Jacket. In terms of your legs what you suggest is just fine – i.e. base layer leggings and a pair of standard trekking trousers. I suggest convertable trousers as some people like trekking in shorts on the lower reaches, but if you are comfortable in trousers that’s fine. You will only start wearing the leggings higher up on the mountain, probably from 4000m and above. I also suggest taking a pair of waterproof trousers in case you encounter rain. These can be worn over your standard trousers to avoid them getting wet. As for your torso, your suggested setup looks good. I might also suggest you take a fleece as an additional layer. Hi, I will be climbing Kili in June. I was told the legs wouldn’t feel as cold as we are constantly walking. I plan to wear my TNF expedition base layer + my Black Diamond Dawn Patrol LT pants, which I understood to withstand some wind. Would that be adequate for summit day? Hi Stanley, that is true, most people don’t feel the cold in their legs. The extremities – hands, feet and hand (nose) – feel the cold first. Your suggested layering for you legs should be sufficient to stay warm and comfortable. 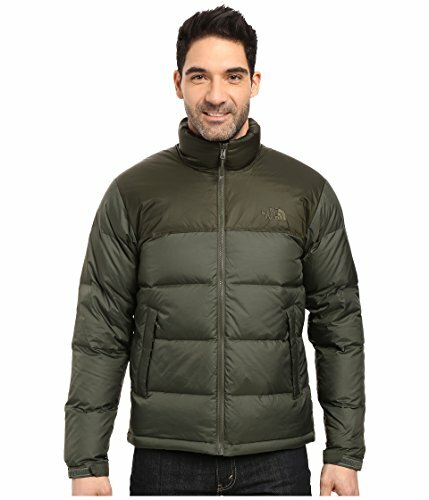 Hi guys, I am climbing Kili next week and I was wondering if this core jacket will be up to the task of keeping me warm with a polartec fleece and base layer underneath. Hey Mark, you will be absolutely fine with this jacket. Good luck man! Thanks for being such an informative site..very helpful. 5. 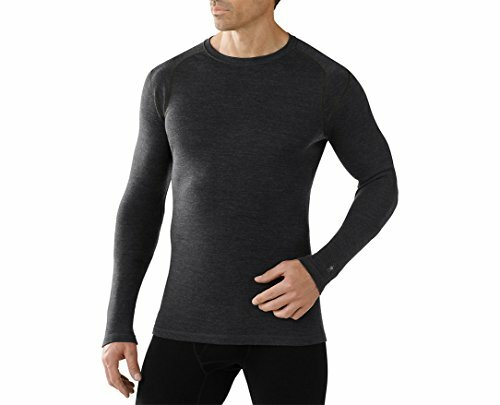 1x icebreaker merino blizzard top (long sleeve no hoody) – lady in shop told me this is like a fleece or polar fleece – mid layer . 6. 1x merino loft jacket “stratus” with hood. This is apparently their warmest jacket and similar to a down jacket. it’s pretty lightweight although not that compressible. – was going to us this as my outer layer….:?? Will this be warm enough? Or should I return this and get a down jacket.. I haven’t got to my bottom half yet but will email when I’ve sorted that. Hi Suzi, your packing list sound good so far. The base layers and shirts sound absolutely fine, as does you warm jacket and wind / waterproof layer. So far so good! – Patagonia Down Sweater hoodie. Would this be sufficient? I am confused on whether the down sweater (which I already have) would be good or I need a better hard shell water proof/ wind proof jacket (which i would need to buy/rent). I have a light weight rain jacket (meant only for rain and not cold.) Would it make sense to use this on top of the down hoodie? My body tends to warm up quickly and I tend to sweat a lot. When I did the inca trail i realized I was good while I was on the move in the cold but whenever I took a break I would start shivering due to the sweat. I am worried I will have the same problem on Kili since it is going to be far more colder. Hi Anuj, your suggested layering system should be sufficient for Kilimanjaro. A hard shell is recommended as conditions can be very windy and wet with snow, but you could get away with just using your light weight rain jacket to protect against the elements. I think there should be enough warmth in your layering system. All the best! Thanks! 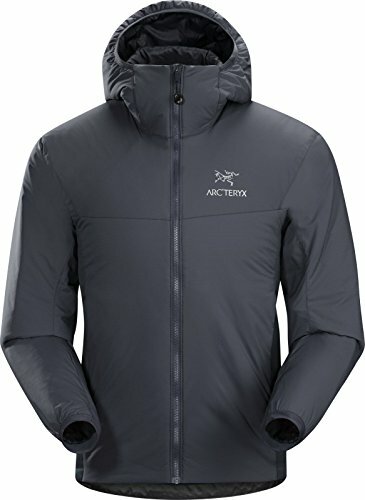 I decided to err on the side of caution and ordered Arc’teryx Alpha Comp Hoodie to go with my down jacket. Got a good long weekend deal on REI. Hi, I am planning to do Kili in Jan/Feb and quite confused with all the options! I am used to the hills in Scotland and the cold never bothers me at all but the rain can be constant so guaranteed waterproof jacket and trousers over light clothes are what I focus on here. 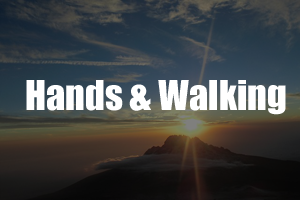 My main concern on Kili is keeping hands and feet dry and warm as my circulation is not great? I don’t really know if Kili can be wet at this time of year but my inclination is to have very lightweight rain gear and standard hiking attire underneath! My body never feels the cold when walking, seems like I have a built in heater. Does this seem sensible? Any advice on standard attire for a hot person would be appreciated. Also got a pair of north face apex trousers (nylon outer with brushed inner), would they be appropriate? Many thanks. Hi Bryan, Kilimanjaro can see some rain on the lower reaches in January/February so lightweight rain gear is a good idea. Encountering snow and high winds near and at the summit is also likely during these months so you might want to take a hard shell jacket to wear over your warm winter jacket. In essence I would recommend having a number of layers which gives you the flexibility to layer up or down as your ascend in altitude. If you find you are too hot you can always layer down. Good winter gloves and inners, a warm beanie and warm socks are also a must! Your North Face Apex trousers will do the job. Hope this helps! Hi there – I was told that I could be fine wearing leggings instead of hiking pants. I have rain pants if it gets wet. Is this sufficient? A pair of lighter and a pair of warmer leggings? Hi Alexis, you should be fine with light and warm leggings, although summit night you might want to wear your rain pants in addition to the warm leggings, especially if it is windy. This site is amazing and so informative! Also, you have been absolutely patient in answering all questions regarding climbing the tallest mountain in the world! Would you advise if this is sufficient? Also, on summit night, I will layer up on my upper body and only use the IB leggings, Fjallraven Vidda Pro and Patagonia Torrentshell. In your opinion, is this warm enough? Hi Candice, you look very well prepared! 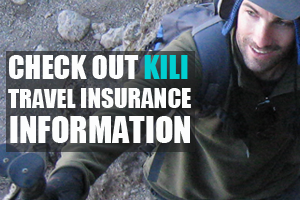 Your kit list is perfect for Kili! The planned gear for summit night will be more than sufficient. Best of luck! I have been told that I should be careful over the colour of clothes and to avoid certain colours (blues/blacks) due to the flies, is this something you agree with? Hi Katy, on the mountain you shouldn’t have too much of a problem with flies or mosquitoes. In Moshi or Arusha it is worth wearing lighter colour clothes as flies and mosquitoes are less attracted to white colours. I am climbing Kili via the Lemosho route starting the actual climb on 24th August. I have base layers and fleece and Rohan wind/water proof goretex jacket. However I have no core jacket – but i do have a Schoffel Ski jacket -would this be sufficient for the latter stages and summit night? Hi James, yes, your skit jacket should be fine as your warm outer layer, especially if you can use it in combination withe your Rohan Goretex jacket. All the best! I’m climbing Kilimanjaro in the last two weeks of august. I’ve got a montane featherlight down jacket as well as a prism jacket, as well as base layers/fleece. Will that be enough for the top or do I need a thicker coat? Hi Lisa, Your clothing setup is perfect! Good luck! What about the Obermeyer Dakota Insulated Jacket for summit night? Is that enough for a top layer with base layers and a fleece underneath? Hi Lynn, you can probably get away with this jacket, as long as you have a good base layer and fleece. All the best! Thank you once again for helping us all prepare for the climb. You kindly responded to me questions re my upper half and i have finally got the bottom half sorted and wanting to know if what I’ve got is sufficient. 1 X merino wool 150 weight thermal longs! 1x gortex outer shell macpac waterproof and wind proof outer layer. Just wondering if this is sufficient and if I need to take another pair of pants? Hi Suzi, Your list is perfect! I wouldn’t change a thing. And from what I can see you shouldn’t need another pair of pants. Hope you have a blast! Thank you so much for your wonderful website. 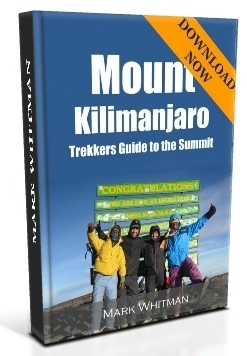 My group has been referring to it religiously in preparing for our September Kili summit on the 7 day Machame Route. I’ve purchased new, high-end brands for boots, socks, sock liner, gloves, and glove liner and have many head layers as well. But for the rest of the clothes, I’d like to try and reuse as much of my own clothing as possible. Can you let me know what you think about this list? From closest to skin to outside. 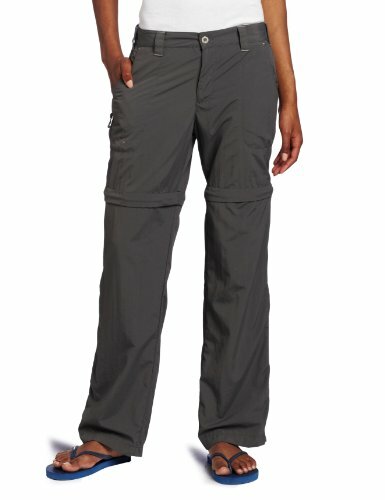 Fleece-lined leggings, Linen/viscose trekking pants, Hard shell insulated ski overalls. Is this sufficient? Are the ski overalls a bad idea? Thank you!! Hi Genevieve, Thanks for your kind words. Your Top and Bottom layers are perfect! 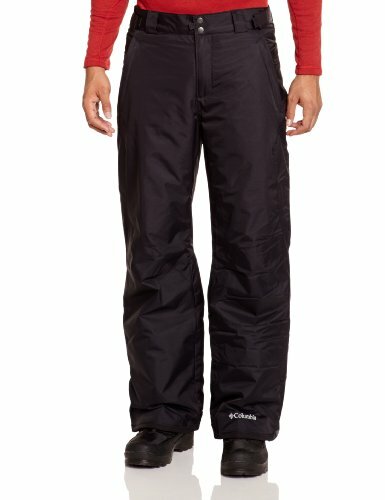 Ski pants are a good shout for an additional layer of insulation and waterproofing / windproofing. All the best for the climb. I’m sure you will have a blast! Less than 3 weeks until we start up Kili (Lemosho route) and we’re having some second guesses on our gear. Since your lists have been so invaluable in planning, I thought I’d ask for some guidance while we still have time to add or subtract things. My husband has the REI magma 850 and North Face Venture 2 jacket as his summit combo (on top of long underwear and a 200 fleece). I get colder and was planning on a number of layers: UA Coldgear base, Coldgear Infrared Hoodie, LL Bean ultralight down 850, and then renting an insulated parka on top of that. However, I also have an old Marmot Gore-Tex jacket which I was planning on using as my raincoat. Will I have too many things and/or will he have too few. Hi Yelena, Exciting times! I’m sure you guys are going to have a blast. In terms of your kit, you both sound all set. Your husbands combo will work well! Your layering system looks good too. I don’t think you will need to rent a insulated parka. The four layers of your base, hoodie, ultralight jacket and gore-tex shell should be more than sufficient. As for your legs, it is common for women to trek in leggings so I’m sure you setup with a lightweight pair and an insulated pair will work a treat. A waterproof layer is always a good idea just incase you do encounter wet weather. All the best with the trek! You guys sound very well prepared. Hi Andrew, that is a solid setup. Base is good. I’m a bigger fan of lightweight sweaters so personally I would prefer the Better Sweater but the Snap-T Hoody will also be excellent for Kilimanjaro. In terms of your insulated jackets, both are fine. I prefer Arc’Teryx, but the Patagonia Down will do the job just as well. Shell is perfect. All the the best! This list is great-thank you! I will be climbing in January Gd willing and I’ve never done a long trek before so I don’t have any of this kind of gear. If I have layering items that look to be about the same as what you have as examples, would those work? Or do I need to purchase layering items with these particular brand names? Hi Mimi, great to hear that you will be climbing Kilimanjaro soon. If you already have gear that has similar features to the ones recommended here, then you should be all set. It is less important what brand you take and more important that the gear performance well given the conditions on Kilimanjaro. Hope you have a blast! Hi Kelvin, your base layer is the first or next to skin layer. Generally these are not bulky layers, but instead fit snuggly to the skin, allowing moisture to escape to the next layer, whilst providing a nice level of warmth. Thing thermals. Thank you, I think I’ll go to the library and find pictures of the place. I will keep the article, just in case, someday, perhaps, etc. Can I get some of these items at Kilimanjaro region ? I have very less time left with me and will have to buy few items from there itself? Any idea? Yes, you can hire most gear in Moshi or Arusha. Is the Skiing jacket enough for the Kilimanjaro for the temperatures in February? and skiing trousers? Hi Daniel, yes, a warm ski jacket and trousers will be sufficient, as long as you use them in conjunction with layered clothing. Hi Jacob, your merino inners and Ferrosi pants should be fine. Thank you so much for your wonderful website and the useful information. As I am just getting started with the preparation and I dont have any of the jackets described above I was wondering if it is a good idea to buy 3 in 1 jacket. I was looking at this one – North Face ThermoBall Snow Triclimate 3-in-1. I am going to climb Kilimanjaro in the last week of Sep. Please let me know your advice! Hi Nina, the ThermoBall will do the job!